So, you think the colour on your tablet or phone looks pretty good, right? Try this. Hold your portable device up next to your desktop. Are your colours too pumped up or have they lost the level of saturation you expected to see? Are your shadows blocked up? Do your images look different on your tablet compared to your desktop? If you answered yes to any of these questions, then it’s time to calibrate with ColorTRUE– the new colour management app that delivers true tablet-to-desktop screen matching (from the leader in colour calibration and profiling, X-Rite Pantone). Now you can show your photos with absolute confidence knowing they are colour accurate. The process is incredibly simple. Using a supported X-Rite measurement device*, ColorTRUE quickly and easily measures the colour of your Apple® iOS or Android® device, creating a custom profile. This profile is then automatically applied to your images in the ColorTRUE Image Gallery (which are seamlessly linked to your existing albums). Now all your images are displayed accurately! With ColorTRUE, you can be assured your images are showing their TRUE colours. Unlike your laptop or desktop operating system, iOS and Android operating systems do not have system wide colour management capabilities. 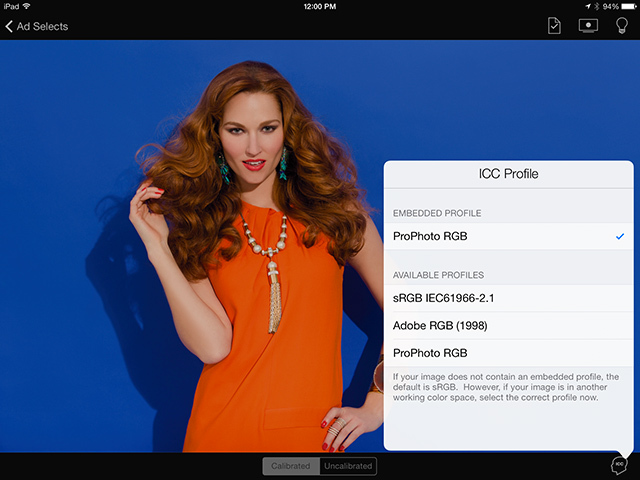 Therefore, each app must apply colour profiles individually. Through X-Rite’s ColorTRUE Aware Partner Program, we are collaborating with other app developers to allow them to seamlessly access your ColorTRUE profile within their app by using X-Rite’s mobile colour management software development kit (SDK). This way, any ColorTRUE Aware app can display colours accurately and consistently. So help us spread the word by telling your favorite app developers you want them to be ColorTRUE Aware! Perfect Colour. Anywhere and Everywhere.